This summer, we have seen an increase in people purchasing the iOSAT tablets. iOSAT was developed by ANBEX in 1979 following the meltdown at Three Mile Island nuclear plant. iOSAT was developed for the purpose of protecting people from accidental or terrorist-related release of radioactive iodine from nuclear power plants or from nuclear weapons. In 1982, iOSAT was approved by the US Food and Drug Administration and it is known today as the only full-strength tablet which may legally be sold in the US for preventing radiation blocking. 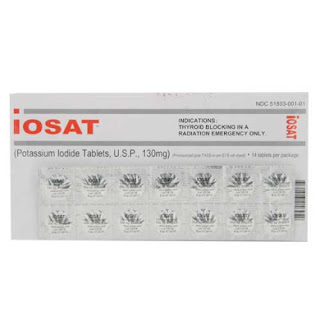 According to ANBEX, the value of Potassium Iodine in preventing radiation blocking has been known to man as early as the 1950's. "Development. The value of KI as a radiation protective was first recognized in 1954 following a Pacific nuclear bomb test. Shifting winds blew radioactive fallout in an unexpected direction, contaminating two small atolls 150 miles away. Although residents were quickly evacuated, it was too late. Within 20 years, most of the island's adult population, and all of its children, had developed some form of thyroid disease or cancer. "Doctors studying the problem soon realized that radioactive iodine in the fallout had entered the island's food and water supplies. It had been inhaled and ingested by the islanders and absorbed by their thyroid glands. Over the years it led to the steady, inevitable, development of cancer and other thyroid malfunctions. While the fallout had contained traces of other radioactive products, these had played little or no role. iOSAT is available today at Survival Superstore. Stop by and pick up your tablets to protect your loved ones from a nuclear emergency.